Provided by a vendor named Elsevier, Science Direct is, as its name suggests, our best database for researching scientific topics. However, it's also great for social science (education, psychology) and business topics. All journal articles in Science Direct are scholarly. The books in Science Direct are also scholarly. However, reference works and images cannot be considered scholarly. Scroll down the alphabetical list and click on Science Direct. That will take you to the Science Direct main page, from which you can either search for your keywords or browse by topic. You will see the Basic Search boxes at the top of the screen. Type your search into the box and click the Search button. You can also Browse Publications By Subject area using the expandable list right below the search box, on the left side. If you know the title of the journal you want (not the article!) you can use the Browse Publications By Title menu, which is below the search boxes, on the right. To get to the advanced search screen, click the Advanced Search link, which is in small print, way over to the right of the Basic Search boxes. First decide whether you want to search All Sources, Journals, Books, Reference Works or Images, using the tabs up at the top of the search box. 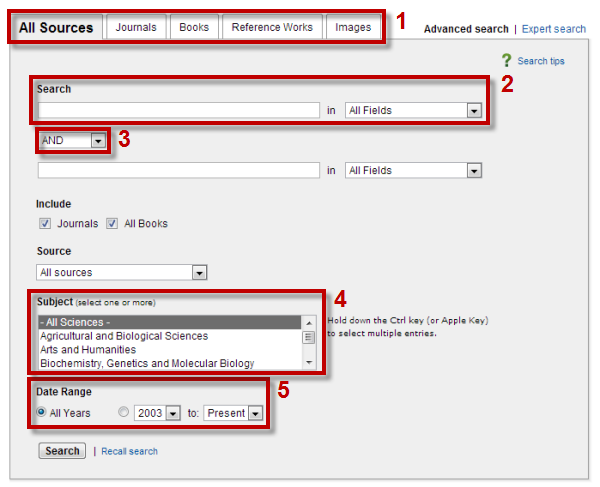 Unless you specifically want books, Reference Works, or Images, choose the Journals tab. Keywords - Science Direct is confusing because they use "Keywords" to mean "Descriptors" or "Subject Headings." These are the official keywords in the article's description. For more information about that, see Controlled Vocabulary. A pull-down menus between the two search boxes lets you join the search boxes with AND, OR or NOT. By default, Science Direct puts an AND in between the search boxes. You can use the pull-down menus to to change it. Boolean-savvy users: Science Direct treats each search box like a giant set of parentheses. Your search results page will display 25 search results per page, by default. If there is more than one page of search results, you will see page numbers at the top and bottom right so you can look at all of them. Search results are displayed in order from most relevant to least relevant. The DOI is a unique identifier and permalink for the article, and is needed to cite the article. You can also use it to get back to the article later. An outline that you can use to click through the HTML full-text. Download PDF and Export citation. Related Articles - a great way to find articles on the same topic! Science Direct almost always has the full-text. The exceptions are articles that are still in pre-publication status. Because they are not published yet, they will not be available through Google Scholar or any of the other library databases either. Articles are available in HTML full-text. You can find them by scrolling down below the Abstract in the Article Information page, and you can also navigate from section to section and from image to image using the Outline on the left side of that page. 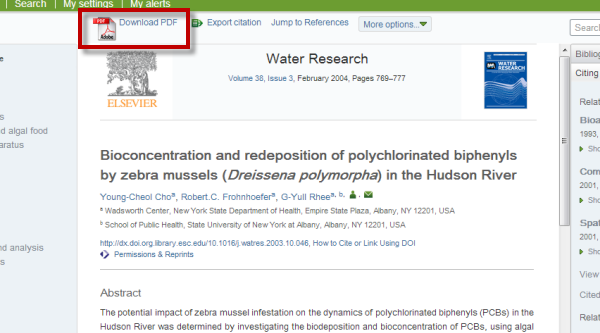 Science Direct lets you download (save) the PDF full-text from two locations. One is right under the article in the search results list. See below. The other is at the top of the Article Information page. See below.